We believe in disseminating original content that produces authentic, meaningful conversations. Register for the Aerial Futures mailing list to be the first to hear about the 2019 program. While the themes of AERIAL FUTURES are universal, they are anchored into place and localized to tell a compelling and inspiring story. THE THIRD DIMENSION examines the emerging Urban Air Mobility (UAM) market, understanding that with the rapid advancement of autonomous technology, many cities are looking to the sky as a third dimension for transportation and growth. This value proposition underscores the potential to create a healthier and efficient future for urban mobility, allowing cities to unlock the lower skies and expand their capacity for distribution of goods and passengers through self-piloted flying vehicles. This think tank will discuss provocative approaches for the safe deployment of UAM vehicles above urban areas and considerations to best prepare cities for the upcoming aerial revolution. 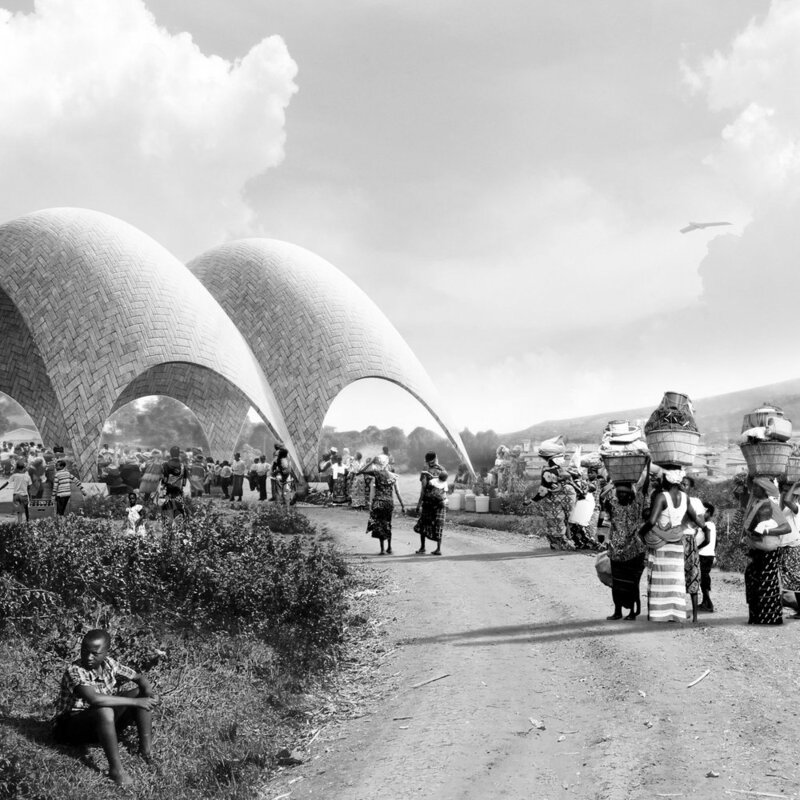 LAKE VICTORIA CHALLENGE provoked discussion about droneports as new architectural interfaces between land and sky: much like every European town once had a train station, what if every African town had a droneport? Building on the 2016 Droneport Project, initiated by EPFL-Afrotech and designed by Foster + Partners, this think tank explored imaginary architectural approaches that enhance the shared economic value and scalability of droneports in remote, rural areas, including private-public partnerships and financing business models. The think tank produced design sketches for droneports in Mwanza and Juma Island. THE NEXT FRONTIER investigated the emerging commercial space flight market and the opportunities spaceports provide as catalysts for disruptive innovation in technology and mobility. This think tank explored the future of commercial space travel and the transformation of Houston’s Ellington Airfield into a world class commercial spaceport. Specifically, this think tank brought together industry experts and thought-leaders to discuss both practical and visionary responses to issues around air traffic control management and spaceport design and planning to technology and the overall impact the spaceport infrastructure has on the broader airport ecosystem. CONSTRUCTED LANDSCAPES examined the contemporary airport's emerging and unprecedented role as real estate developer and urban planner. Taking Denver International Airport (DEN) as a case study, this think tank looked at the opportunities and risks faced by the airport in their new role as agents for urban change. Selected participants interrogated the myriad ways that technology is transforming greenfields into connected, integrated airfield communities. URBAN CONSTELLATIONS explored airport-city interfaces as infrastructure, operating at a metropolitan scale. This think tank used New York City as a case study to trigger responses across disciplines. Selected participants reimagined airport constellations as a choreographed urban ecosystem that relies as much on architecture as it does on technology and data-driven design. Participants of the LEADING EDGE Symposium took part in a two- day symposium with lectures, curated panel discussions, professional workshops and intimate networking events on the future of aviation and airport design. Hosted at the A + D Architecture and Design Museum in Los Angeles, this program was supported by guided site visits at the Los Angeles International Airport, exploring first hand the impact of aviation and travel trends on the airport of the future. NEW FUNCTIONS responded to the 2017 Chicago Architecture Biennial by placing contemporary airport developments into an historical context. Looking at the present to make sense of a new history, a select group of architects and experts got together to discuss critical themes for airports today, such as lifecycle and adaptive reuse of terminal buildings, strategies for human-based design, and the nature of public space in light of complex business models. SKY'S THE LIMIT brought together a group of international and local pioneers to discuss how airports can be catalysts for architectural innovation. Experts discussed the inherent environmental, economic political and social implications associated to these prototypical projects, along with the risks and promises that they carry. As part of the official collateral events of the 15th International Architecture Exhibition of La Biennale di Venezia, AERIAL FUTURES: GROUNDED VISIONS, Shaping the Airport Terminal of Tomorrow was a two-day symposium that took place from October 17th to 19th, 2016. The symposium brought together diverse voices in a discussion about the future of air travel, as seen through the lenses of architecture, design, technology, culture and user experience.